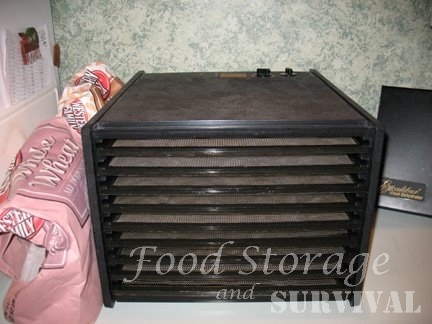 A dehydrator is a fantastic tool for food preservation. 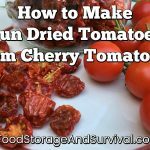 I have used mine to dry green beans, corn, zucchini, tomatoes, apples, apricots, strawberries, herbs, actually anything that gets in my way when the dehydrator is out has the chance of being tossed in the dehydrator and dried. It’s really big–I can dry lots of stuff at one time. Timer (this way I can dry stuff while I’m sleeping and it doesn’t get too dry). I can dry large items by leaving some trays out to make more space for what I’m drying. The heater/fan is in the back instead of on the bottom–the bottom is smooth so it is really easy to clean up. The trays can go in the dishwasher (top rack only I think). It’s really big–so if I’m only drying a small amount of stuff, the dehydrator is the same size as if I’m drying lots of stuff. The internal temperature is not as even as it is advertised, so I do rotate trays from the top and bottom toward the middle about half way through the drying process, although you’d have to do this with a stacking type dehydrator also. The rotating process is really simple–I just pull out the two trays I want to swap and stick them back in opposite locations. Umm . . . . I guess that’s all for cons that I can think of. Overall it’s a fantastic product. Umm, yeah, can I just come borrow yours? By the way, I’m assuming you donated those dried apples for my birthday surprise today. They were gone before Eldon got home. But thanks, they were yummy! The babies let me have a few. Yep the apples were from me. They don’t last long around here either. I have to hide them! And if I’m not using it you’re welcome to dry something in it also. I have Megan’s apples in it now . . .
Don’t forget about Sharla’s birthday on Sunday!